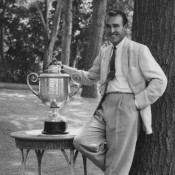 Born in Rumson, Ghezzi won 11 times on the PGA Tour, including one major title, the 1941 PGA Championship, in which he defeated Byron Nelson in 38 holes in the final. Ghezzi, working out of Deal Golf & Country Club, won three State Opens (1937, ’43, ’44) and two New Jersey PGA Championships (1939, ’49). He was selected for three Ryder Cup teams, 1939, 1941, and 1943, but each was canceled due to World War II. At the U.S. Open in 1946, he was in a 36-hole Sunday playoff with Lloyd Mangrum and Byron Nelson. Mangrum won that afternoon by a single stroke over Ghezzi and Nelson. Ghezzi was elected to the PGA of America's Hall of Fame in 1965.